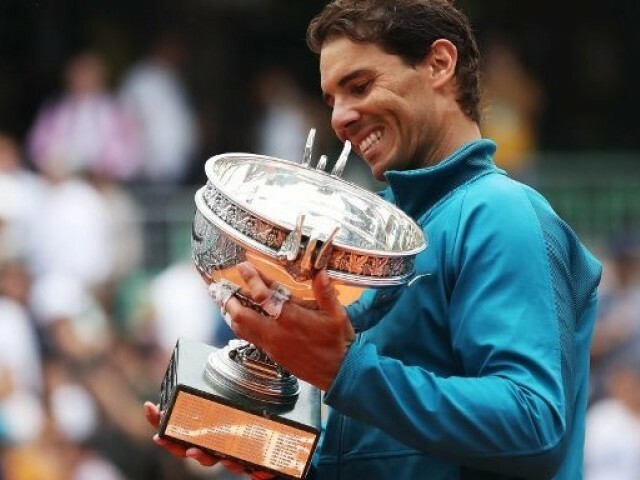 PARIS: When Rafael Nadal broke down in tears on the Roland Garros podium on Sunday as 15,000 people, plus a smattering of Hollywood heavyweights, stood and honoured his staggering 11th French Open triumph, it was enough to make his desperate rivals weep. The 32-year-old Spaniard had wrapped up his 17th major, taken his career earnings beyond the $100 million mark and extended his record in Paris to 86 wins and just two defeats. It also intensified the headache facing tennis’ highly-rated but woefully under-performing next generation. How do you solve a problem like Nadal? Or Roger Federer or Novak Djokovic and Andy Murray for that matter? Since Nadal won his first major at Roland Garros in 2005, the ‘Big Four’ have claimed 48 of the past 53 Grand Slam titles. In their careers, 36-year-old Federer has 20 majors, Nadal 17, Djokovic 12 and Murray three. Stan Wawrinka, it should not be forgotten, also has three Slams although his name is usually an absentee when it comes to such number-crunching. Nadal’s victory on Sunday meant that the last seven Slams have been shared between players who are 30 and over. Furthermore, world number one Nadal has a record 32 Masters 1000 titles, Djokovic 30, Federer, 27, and Murray 14. Such is their dominance that former world number one Marat Safin, a two-time major winner, told reporters at the French Open that he would not be surprised to see Nadal and Federer “play until they are 40”. Nadal has not put a time limit on how much longer he intends to keep playing, no doubt wary of the ravages of his injury-hit career which have forced him to sit out nine Slams to rest either his knees or wrists. Those who should be worried are the likes of world number three Alexander Zverev, who again flattered to deceive in Paris. The 21-year-old made the quarter-finals of a Slam for the first time having arrived at Roland Garros with titles in Munich and Madrid and a runners-up spot to Nadal in Rome. The German, however, struggled through three successive five-set matches before being trounced by Dominic Thiem.